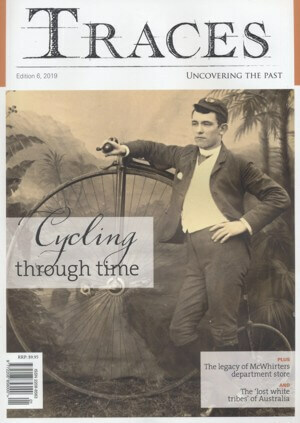 For Australian history lovers and genealogy buffs you’ll be pleased to hear that Issue 6 of Traces magazine is out now. As with past issues, this one is packed with 64 pages of high quality history and genealogy-related articles. It starts off with Heritage news which includes information about a Royal exhibit opening in Bendigo and information on the National Archives of Australia’s Perth research centre that’s just opened. This is followed by a long list of the latest records online. There’s a “Then and Now” article on the stately Flinders Street Station in Melbourne, which covers not only the past, the present but also the future. You’ll read about the history of cycling in Australia, and Part 2 of the Young Irelanders in Tasmania continues the story from last issue and traces the rebels’ daring escape from Van Diemen’s Land. Discover the legacy of Brisbane’s McWhirters department store, while Mary-Anne O’Connor writes how HOPE was Australia’s true gold. There’s a special feature that focuses on Bendigo, Victoria – its heritage sites, history and national significance – plus a researcher’s guide to the city. For family historians, Traces chats to Caroline Haigh who has completed the Diploma of Family at the University of Tasmania. You can read about how Lynette McDermott turned her ancestor’s stories into a book series, the “Garth Trilogy”, and for those who have German heritage, Kate Hutcheson writes an article with great tips for finding your German ancestors. Discover just how useful old maps can be with your research, and share the excitement of visiting an ancestral town. Dr Kate Bagnall writes about the origins of Australia’s early Chinese migrants, and read Alice Anderson who was considered ‘nothing less than a national treasure’ thanks to Miss Anderson’s Motor Service in the well-to-do Melbourne suburb of Kew. Luna Park is known as one of Australia’s longest-standing and most endearing landmarks, but it wasn’t all fun and games as Part 1 “The Dark Side of the Moon” reveals. And read about the ‘lost white tribes’ of Australia, and the fascinating evidence behind it. If you love Australian history and/or genealogy, do yourself a favour and grab a copy of Traces. You can subscribe through iSubscribe, or buy individual issues from Traces magazine themselves, or check with your local newsagent. You can find details of Australian stockists here: www.publicationsolutions.com.au/publication/traces/. NextGet Ready for South Australia’s 2019 History Festival?